Not in the usual sense though as it is actually hot out. Fuuka tells her oniichan to calm down because his fire screaming is only making things worse. That gives Kasumi an idea. She uses Water and Gold Technique together in a Joukyuu Shuriken Ninpou mix. 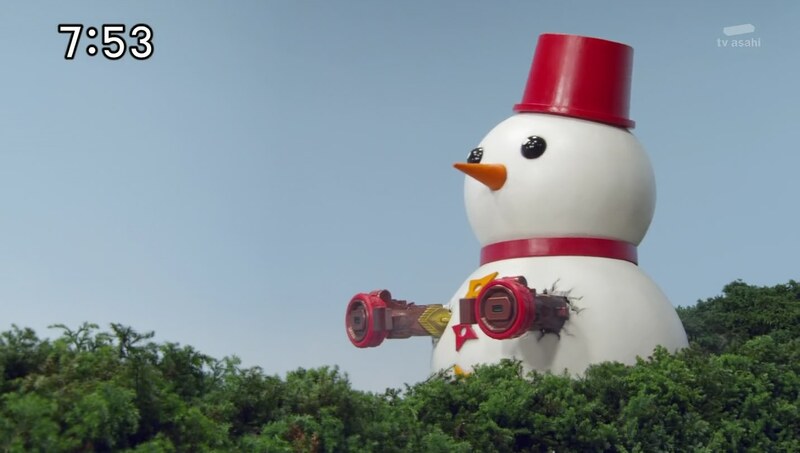 Takaharu is transported to the North Pole. But actually, Kasumi just tested out some advanced Ninpou she’s been studying. She just needs to figure out the timing. Nagi asks Kasumi to teach him when she’s got it down. But Kasumi says Nagi shouldn’t rely on others all the time and that he must challenge himself to grow. Nagi tells Kasumi-chan that he’ll make her eat those words someday. Across town, Ariake no Kata is lounging at the park trying to cool off while Jukkarage are scaring children for some fear collection. The Ninningers arrive and fight them off. Kasumi uses Yakumo’s head to launch her toward Ariake no Kata to whom she uses a mirror to heat her up even more and try to catch her off guard. Kasumi tells Ariake no Kata to retreat if she thinks it’s too hot since the UV rays are bad for old ladies. Ariake no Kata says she will scare Kasumi until her hair stands on end and leaves. The guys marvel at Kasumi being so awesome. Fuuka asks Kasumi if there’s anything she’s afraid of. Kasumi whispers to Fuuka that she is afraid of ghosts. Nagi hears and gets an idea. 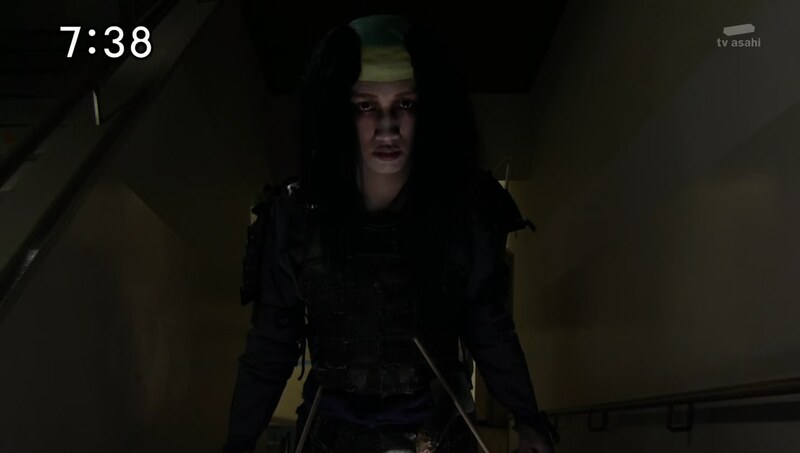 He tells the guys about putting together a Ninja Test of Bravery in which they’ll scare Kasumi. The guys are definitely interested in knocking Kasumi down a peg. Except Yakumo who himself is afraid of Kasumi-chan. Yakumo says he’s not afraid. He’s in. They all head to an abandoned high school on the pretense that there have been reports of a ghost and they must investigate to see if it may actually be a Youkai. Nagi says they should split to cover more ground. Kasumi and Fuuka stick together while the guys dress up in scary costumes. A Jukkarage overhears and reports back to Ariake no Kata. First up is Yakumo as a dead warrior who scares Fuuka and Kasumi up the stairs. The ladies try to hide in a library where they meet Nagi as a ghost. 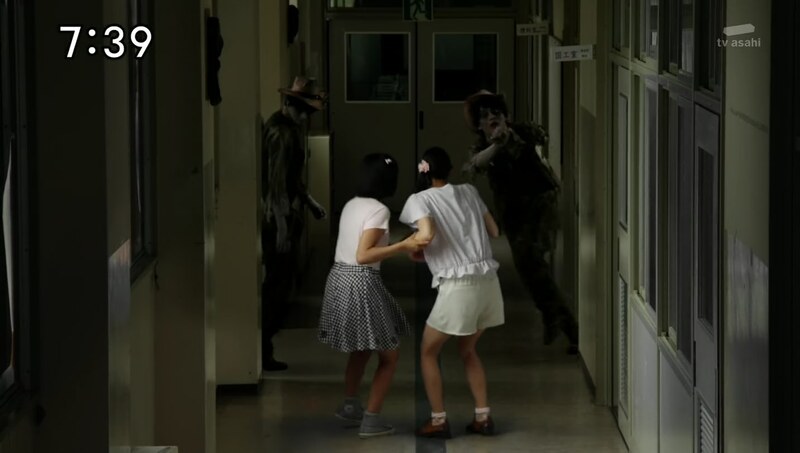 They run out and down the hall, but are met by cloned Kinji as zombies. 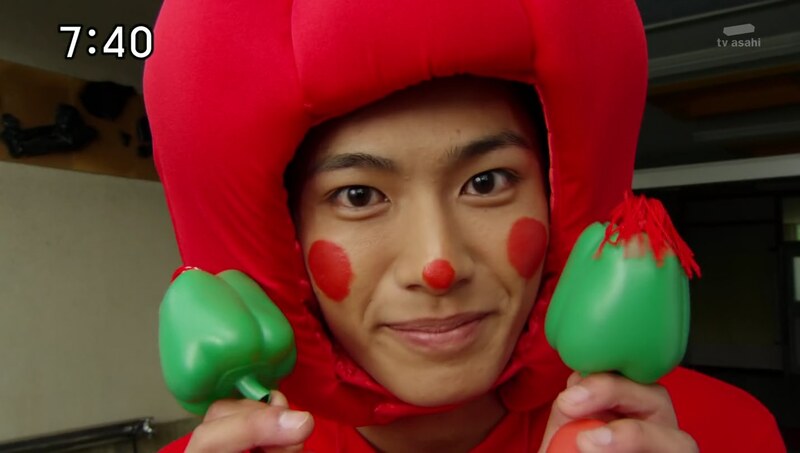 They turn and run the other way where they completely run past Takaharu dressed as a big red pepper. The guys reveal themselves to Fuuka outside. 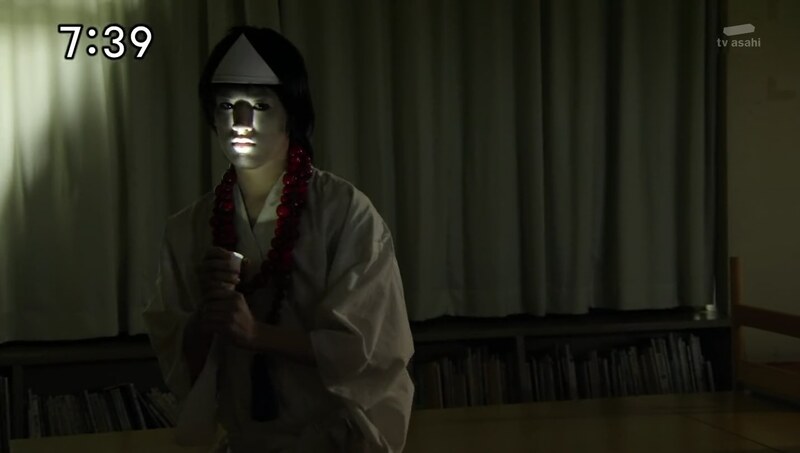 Kinji asks which ghost was the scariest and she says the lady ghost was the most realistic. Huh? None of them were lady ghosts. Fuuka says she’s sure she saw it. Right Kasumi? Kasumi is not with them. They wonder if there really was a lady ghost. None of them are willing to go in to look except for Takaharu. 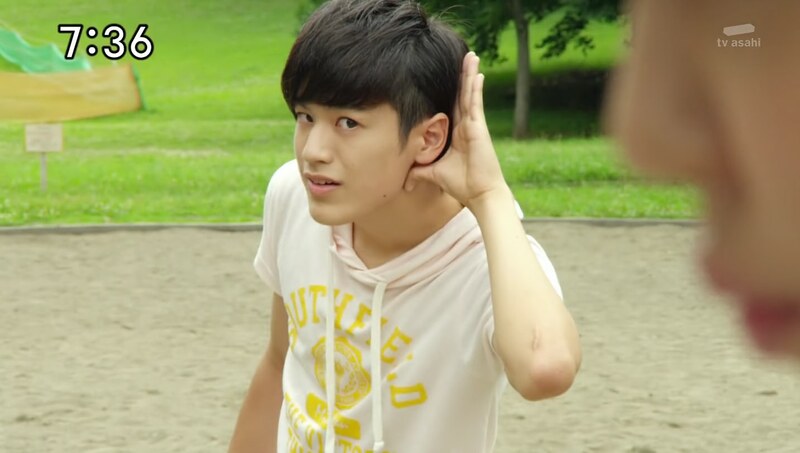 Takaharu’s been gone for a long time. Kinji and a reluctant Yakumo head in next. After a while, Nagi and Fuuka head screams so they head inside. They find a frozen Kasumi as well as frozen Takaharu, Yakumo and Kinji. Nagi blames himself for this since it was all his idea. He begs for forgiveness, but Fuuka sees the real ghost is here. Fuuka pushes Nagi out of the way, but she gets hit on the shoulder with ice. The lady ghost introduces herself as Youkai Yukionna. Ariake no Kata created her from a kakigori cart and ordered to scare the Ninningers, particularly the pink one. Nagi and Fuuka henshin and take their fight with Yukionna to the gym. Yukionna forces Fuuka to dehenge and freezes her. Nagi tries attacking with fire, but Yukionna just swats it away. She mocks him for his young naivety. Nagi remembers Kasumi telling him to not rely on others so he can grow. Nagi uses a Fire and Earth Ninpou mix for a Desert no Jutsu. Yukionna struggles in the desert setting as Nagi teases her with some kakigori. But Nagi slips on the sand and Yukionna stuffs the kakigori into her mouth. They’re back in the gym. Nagi is frustrated that it didn’t work. Kasumi says he at least tried, so that’s a small victory. Kasumi?! She pops up and says she actually used Substitution Technique and thanks Nagi for helping with some Youkai Bait Technique. This was all part of Kasumi’s plan after hearing Ariake no Kata’s threat to make her hair stand on end. 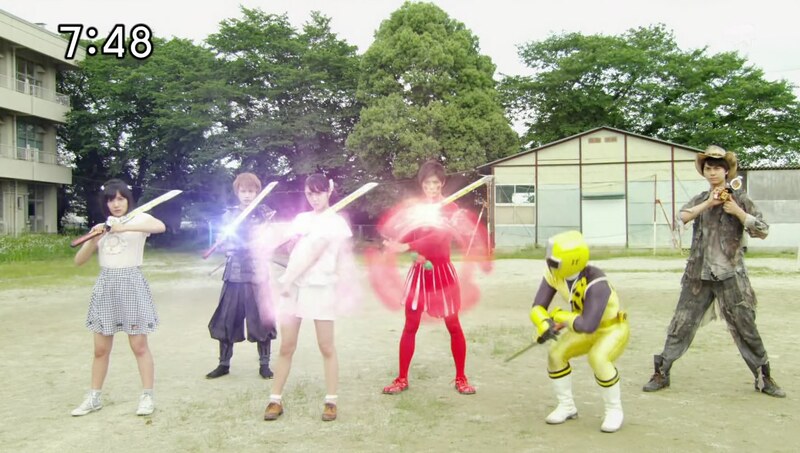 Nagi and Kasumi use a Flame Technique double mix to unfreeze the others and they all head outside. 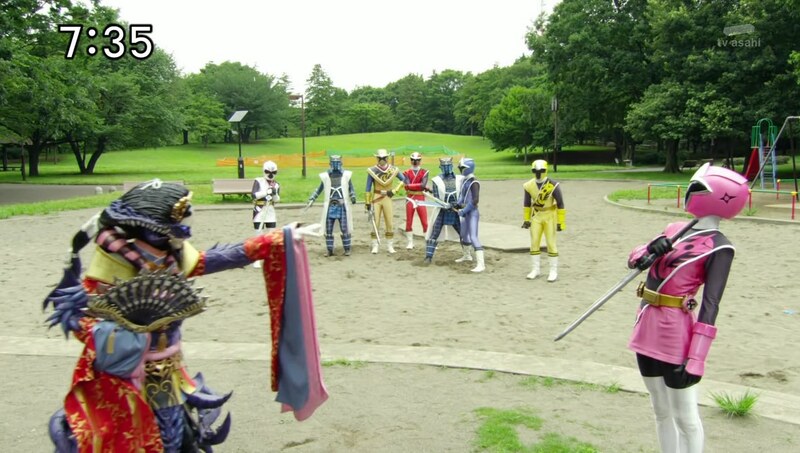 They henshin and take on Yukionna and the just arrived Jukkarages. 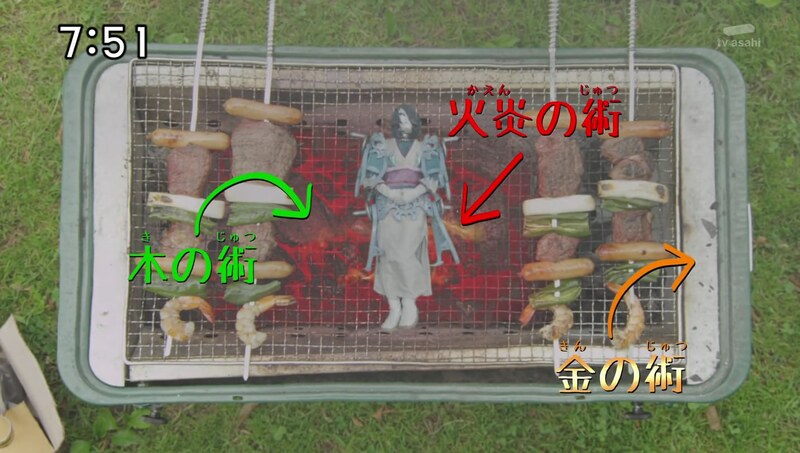 Takaharu goes Chozetsu and together, the Ninningers deliver a Super Flame Technique attack before Nagi uses a Flame, Gold and Wood Technique mix for a BBQ attack. 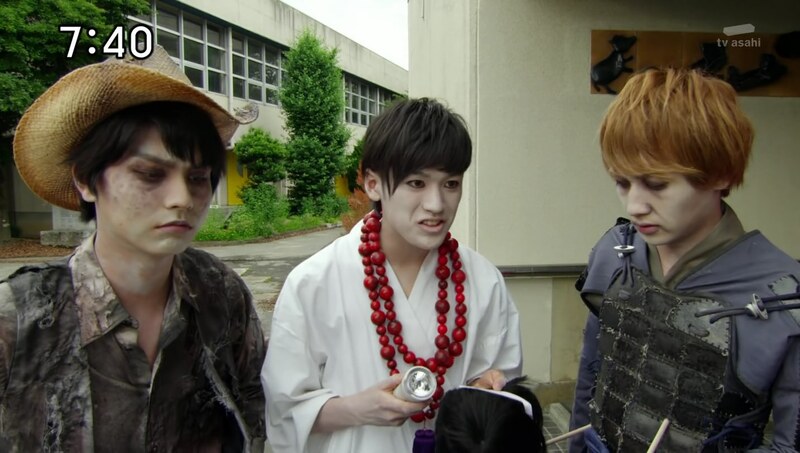 Takaharu, Nagi and Kasumi then deliver a Summer Slash to take care of small Yukionna. Ariake no Kata orders Kyuuemon to embiggen Yukionna and the Ninningers hop into Lion Ha-Oh, ShurikenJin Drago and Bison King. Yukionna blows ice at them and freezes them. Nagi says they should just relax and let it happen. They all get trapped inside a cute summer snowman. Yukionna happily laughs, but it turns out the Ninningers have combined into Ha-Oh ShurikenJin Snowman! They roll forward and finish off Yukionna for good while breaking out of the snowman. Ariake no Kata is upset at how incompetent Japanese Youkai are. That’s why she must summon some from Europe. Back at home, Kasumi explains her entire plan to Nagi and apologizes for getting Fuuka caught in the middle. As for the three boys, they’re being punished appropriately. Father asks Kasumi if she’s really afraid of ghosts. Actually, she loves them! 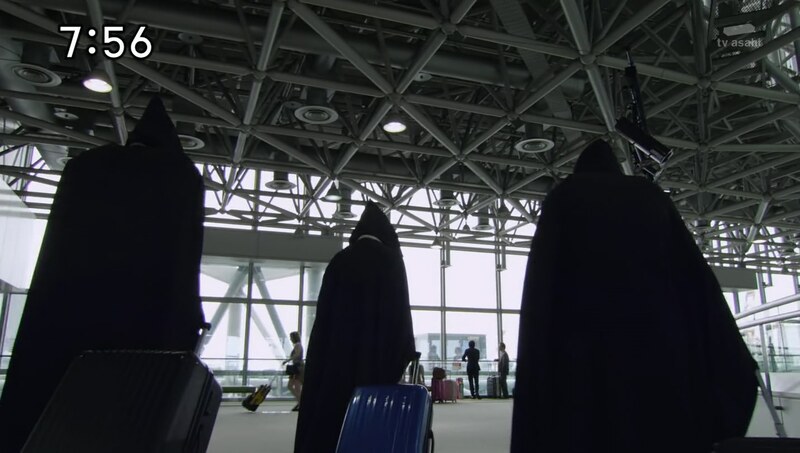 Meanwhile, three hooded figures arrive at the airport. This was a fun summer filler episode. I thought it would be a Nagi-focus, but it really was a Nagi and Kasumi-focus. And that’s great because it continues to develop their bonds with each other and establish their relationships as family. I am enjoying Kasumi being the brains of the operation. And the fact that they try to contrast it with commenting in the past about her being a little flighty or unaware is great. The Youkai of the Week was another nice design. I sure would be scared if I saw her randomly in an abandoned building. lol And Ariake no Kata has been fun so far. Last week I was reminded of Poisandra, but this week I was reminded a little of Madame Noire. I hope they continue to develop the Youkai and give them each distinct, full personalities before Kibaoni arrives. 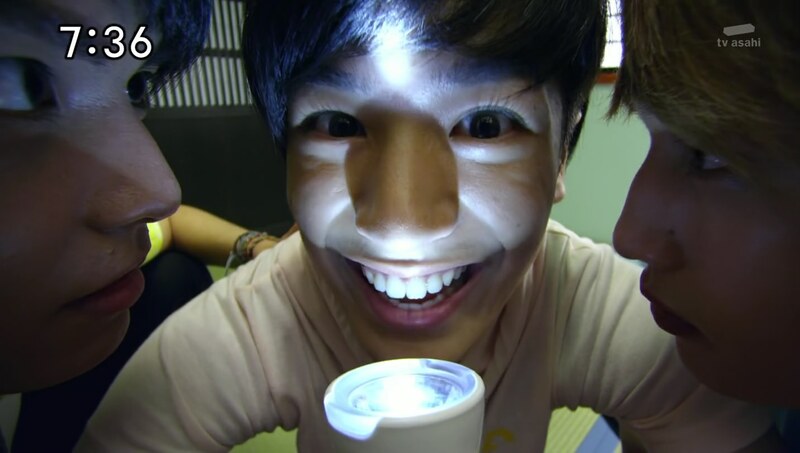 We’ll see how Ninninger continues to move forward though. ← Recap: Kamen Rider Drive, Episode 40 – Why Did the Two Gifted Scientists Clash?